Eighty-five years ago a student crossed a bridge in Sweden and planted the seed of a new paradigm in Geography. A paradigm that eventually led to the invention of the SediMeter. The article below originally appeared in the Lindorm Blog. A hundred years ago Physical Geography concerned itself with the description of landforms and processes, and deductions about how these processes had led to those landscapes. Then in the 1930’s a research student in Uppsala called Filip Hjulström crossed the river called Fyrisån every day on his way to the department. He stopped, took a water sample and measured the water level. He then analyzed the sediment concentration and made a quantitative estimation of soil loss through river runoff. Years later he became the professor of the department, and a series of research students dedicated themselves to the quantification of the geomorphological processes: Åke Sundborg (who would succeed him as professor, studied fluvial processes in the river Klarälven), Anders Rapp (who would become professor in Lund, quantified mass transport in the Swedish mountains), John O Norrman (who succeeded Sundborg, studied coastal processes in the lake Vättern), Valter Axelsson (whose homepage is on a “museum domain”, studied delta deposition), and others. 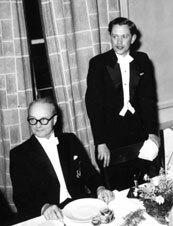 Filip Hjulström (sitting) and Åke Sundborg in 1957. To carry out quantitative geomorphological studies frequently requires inventing new instruments and methods. The department got a world-class Geomorphological Laboratory with flumes and a professionally staffed workshop. Valter Axelsson developed a method for quantification of recently deposited sediments using X-ray and the rectangular Axelsson corer. 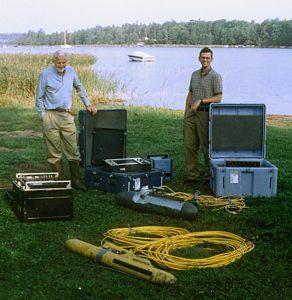 Bengt Nilsson developed a suspended sediment sampler for vertical integrated suspended sediment sampling, during the International Hydrological Decade. The sampler was widely used especially in remote parts of the world, and it is still available for purchase – even though it will soon turn 50 years! Valter Axelsson in the Cachí Reservoir, Costa Rica, putting his quantitative X-ray based method of estimating sediment bulk density to good use (1989). I was lucky enough to have Rapp as professor during my undergraduate years in Lund University, and to then come to Uppsala University for my PhD studies. Having access to the Geomorphological Laboratory and the workshop I was able to develop the SediMeter. The purpose of the instrument in my thesis was to determine the onset of bedload transport on nearshore bottoms, and to find out what happens off the “closing depth”. However, already during the initial field trials in 1986 (under the ice of a frozen lake; working near the Arctic Circle does tend to limit the time available for field testing) I found that the instrument had potential applications that went far beyond those initially contemplated. Bengt Nilsson (left) and Ulf Erlingsson (author) in Örserumsviken, Västervik, Sweden, 1999. Since my career took a different path I didn’t continue using the instrument until I decided in 2007 to develop a new, better version. That second generation was again replaced by a third generation in 2013. Electronics have developed tremendously, but the basic design of the sensor has stayed the same, because it works so well. We now write 2016 and 30 years has passed since the first field deployment of the SediMeter. 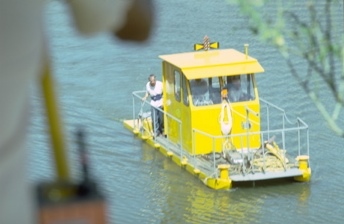 It has developed into the world’s arguably best system for monitoring siltation caused by sediment spill and pollution from dredging and other works. It is also used to monitoring sedimentation in reservoirs, harbors, and navigation channels, and in laboratory experiments, as well as for monitoring resuspension and erosion. The Geomorphological Laboratory is, alas, gone, and the Department of Physical Geography has been merged and reorganized, but a number of instruments and samplers developed in the Uppsala School of Physical Geography live on as commercial products – and the SediMeter is one of them.